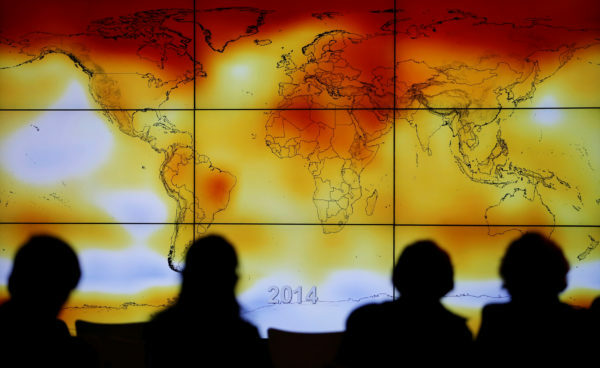 Participants are seen in silhouette as they look at a screen showing a world map with climate anomalies during the World Climate Change Conference 2015 (COP21) at Le Bourget, near Paris, France, Dec. 8, 2015. President Donald Trump is nearing a final decision on whether to withdraw from the Paris climate agreement, with one White House official saying Wednesday that the president is leaning toward an exit but three others cautioning that he has not reached a verdict. The matter has deeply divided the administration for months. Ivanka Trump and Secretary of State Rex Tillerson have urged the president to remain in the deal, and White House strategist Stephen Bannon and Environmental Protection Agency Administrator Scott Pruitt have been pushing for a withdrawal. All but two countries are in the Paris climate agreement. The United States could be the third. Even on Capitol Hill, some Democrats began to condemn the move, before it had formally happened. Sen. Michael Bennet, D-Colorado, said leaving the Paris agreement would amount to an “abdication” of American values. Others cheered the notion that Trump might soon kill the climate agreement that had been such a key initiative of President Barack Obama. According to the agreement, a party that has fully joined the accord, as the United States has, cannot formally withdraw for three years after the agreement has entered into force — and that is then capped by an extra yearlong waiting period. Under those rules, Trump could not completely force a U.S. exit from the agreement until the waning days of his term.